Grandpa may have a tough exterior, but I tell you there is much behind the man! Give him a grandpa gift for Father's Day that will melt his heart. 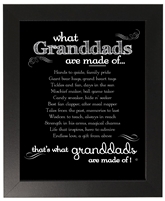 Shop our touching grandpa poems, handprint frames for grandpas, or tell him a new grandbaby is on the way with his own grandparent ultrasound frame.